Here are pictures of my latest project, a knitted rectangular stole done in the entrelac technique. 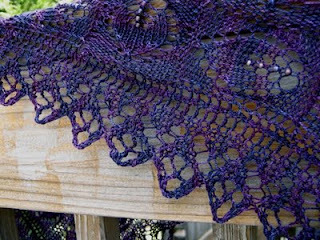 I had never tried this technique before, and wanted to see how it worked, so when the pattern was published in Ravelry, I was very interested. 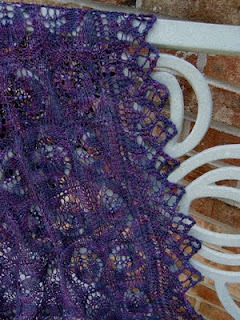 It is the lovely Dianna shawl by Jane Araujo, or MaweLucky on ravelry and the link is here: You must be a member of ravelry to see it, but if you're not, it's free to join, and please do!! 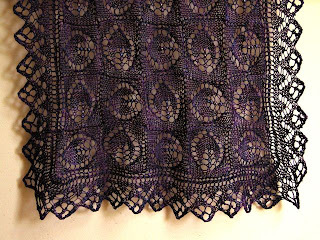 I modified the triangular shape to make it rectangular, and added a knitted-on lace edging from Victorian Lace Today. I am THRILLED beyond belief at how it turned out. There are some beads on the stem of the leaves too, although you may not be able to see them well. I used Blue Heron Mercerized Cotton in blueberry. Cindy... All I can say is WOW! This is absolutely stunning. Your shawl pins will be the perfect accessory. BRAVO! BRAVO!!! So beautiful ... so very beautiful.